The biggest Skateboarding competition in the country - Converse Philippine Skate Summit is on March 31, 2012 in Manila. Converse is looking for City's best unsigned Amateurs and Professional skateboarderes to compete to win a one year supply of Converse apparel and to represent the Philippines in the Asia Crown skateboard competition abroad. Skateboarders from all over Cebu and nearby cities are welcome to this competition. The competition comes with no obligations. That means there is no need to buy anything, or meet any special terms and conditions. Participation is free, and there is no need to pay any registration fee. 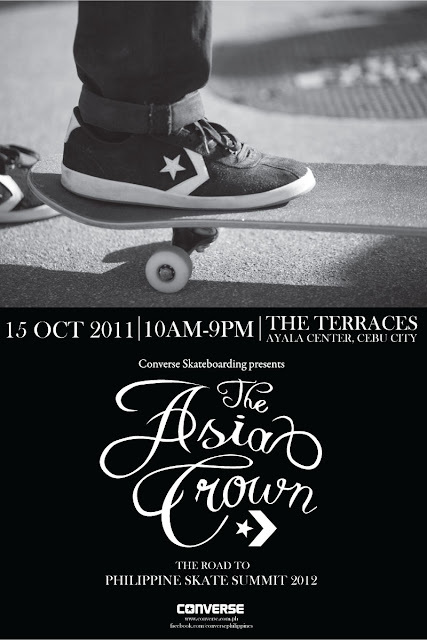 The Asia Crown: The Road to the Philippines Skate Summit 2012 is presented to you by Converse, the premium lifestyle brand that brought to you the Chuck Taylor All Star Shoe, the Jack Purcell, and the One Star shoe among others. Converse is always committed to showcasing the spirit and soul of the skateboard culture. 0 comments: on "Converse Philippines Skate Summit is set on March 31 2012 in Manila"